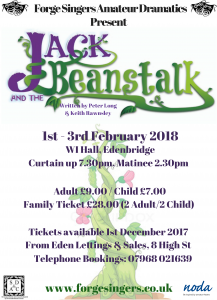 Once Christmas and New Year are over, January can seem such a quiet month…unless of course you are part of the Forge Singers Amateur Dramatics then you will be busy rehearsing for the annual pantomime which this year is Jack and the Beanstalk. The Forge Singers have been entertaining local residents for over 6o years and have previously performed for Winston Churchill and Lord Astor. The group have been rehearsing in earnest since September to ensure that everything will be alright on the night. 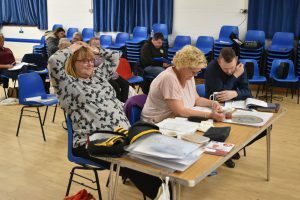 I was fortunate to join them for one of their rehearsals before Christmas to get a flavour of what the audience can expect from this year. 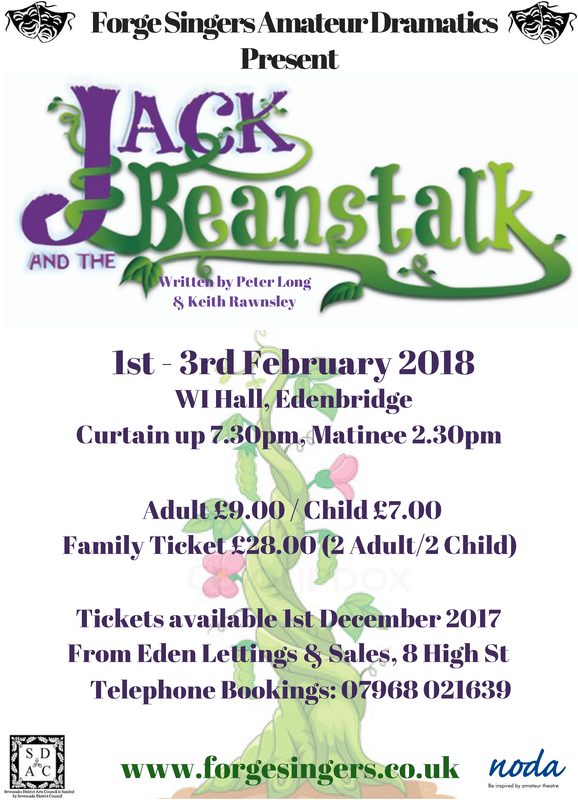 Jack and the Beanstalk, which is taking place at the beginning of February, is being directed by Tracey Newbury and Di Kingham and is certainly going to provide more laughs, plenty of audience participation (it is panto after all) and more merriment than you can shake a stick at. One of the major elements in progress was the costume design and Di was busy rushing around after cast members to get measurements. There is still plenty to do but, as always, I know it will all come together on opening night as it always does every year. With only three evenings of performances and a matinee you’d be wise to purchase your ticket in advance to ensure a seat at the WI Hall – I already have mine so I might see you there!